Spending a couple of days with a BoatUS Catastrophe Field Team in the wake of a major hurricane will change your take on marine insurance, maybe forever. There was an otherworldly quality to the debris that lined the sides of the road, towering higher in places than the roof of our jouncing, dust-raising SUV. It was like someone had taken absolutely everything associated with normal life in Florida’s Lower Keys—the washing machines, flatscreen TVs, T-shirts, books, newspapers, coolers, clocks, jon boats, patio furniture, purses, basketballs, fishing rods, medicine cabinets, cushions, radios, toys, trash ncans, bottles of hairspray, two-by-fours, teddy bears, roofing shingles, diapers, window screens—and tossed it all into a gigantic Waring blender, hit the ‘On’ switch for a minute or so, and then poured the entire evil, stinking mess back out onto the wind-blasted ground. At one point, I noted a sign nailed to a tree, presiding over the whole, bifurcated horror show: You Loot—We Shoot. 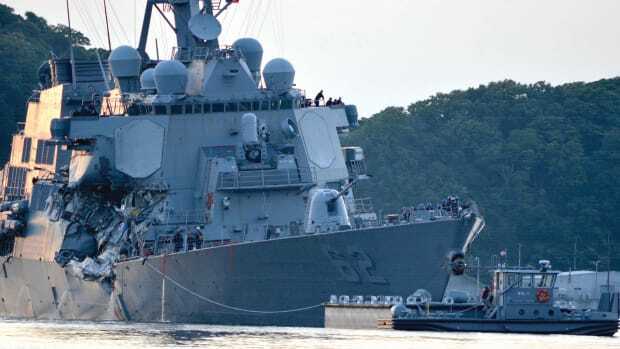 “It must have been beautiful back here before the storm,” said BoatUS Vice President of Public Affairs Scott Croft as he swerved to avoid a chunk of twisted metal. He was working the SUV through what seemed to have been a nice, residential neighborhood on Big Pine Key, just north of where, a few days before, Hurricane Irma had come screaming ashore as a monstrous Category 4 storm, with maximum sustained winds of 130 mph and gusts of 160. “What’s the lady’s name again, Scott?” I asked, still feeling a little unnerved by destruction on a scale I hadn’t witnessed since Andrew’s aftermath in 1992. 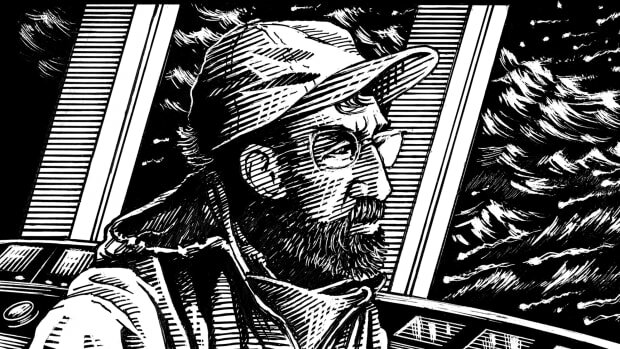 The two of us were trying to find and interview a BoatUS customer who owned a Glacier Bay 26, with Big Pine TowBoatUS skipper Kevin Freestone leading the way in a white pickup truck. Freestone, a volunteer firefighter as well as a towing and salvage guy, seemed to be doing his best to help virtually ­everybody who came his way on this particular morning, including members of the BoatUS Catastrophe (CAT) team with whom Croft and I’d linked up earlier and who were now working the area. We stopped in front of an impassable, storm-tossed driveway. The yard was a wreck, too, and the house beyond badly damaged. Three people had just gotten out of a blue Ford 250 pickup parked beside a leafless tree. The eldest, Carol Hawkins, greeted Croft and I with a gracious, stout-hearted smile, despite the fact that she was just seeing for the first time the havoc Irma had wreaked upon her Big Pine property. She then introduced her son-in-law Jason Dyrda, and her daughter Jennifer Hawkins-Dyrda. 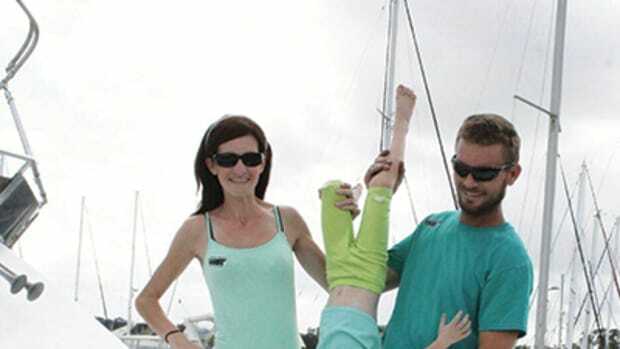 The three of them led us toward the back of the house where they hoped the boat was, stepping over and around ripped metal siding, shards of plastic, and broken glass. 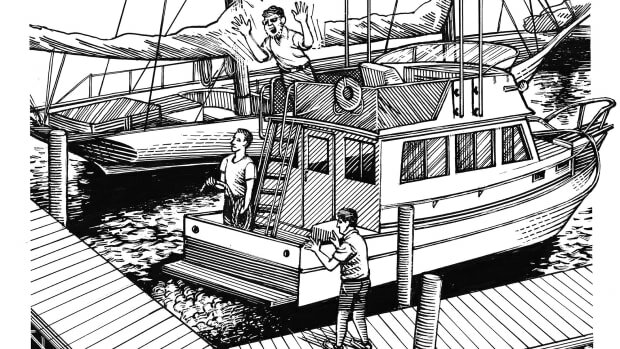 When Carol’s small, canal-side dock came into view, we also saw the Glacier Bay 26, dangling askew from a twisted, welded-aluminum lift, her bow submerged, her twin Mercury outboards pointing towards the sky. Incongruously, an overturned Port-O-Let lay off to the left atop a mound of rank, dried sea grass and, to the right, a sunken trimaran’s three bows projected dramatically from the center of the canal. Carol went towards the boat as if drawn by a magnet. And as she got close, she put her left hand on a ravaged chine, patting it, then partially supported herself against the boat. Jennifer came over and put her arm around her mother’s shoulder. Silence reigned for a long moment while Carol valiantly attempted to politely maintain the gracious, stout-hearted smile she’d employed earlier. Croft and I were guests, after all. Manners were important, even under the circumstances. “I’m sorry, Carol,” I said. Driftwood Marina and Storage in Marathon, just a few miles east of Big Pine Key, was hit very hard. Tornadic cells were in part responsible. Later that evening, after Croft and I’d spent the rest of the day talking with other sorely distressed boaters, boatyard staff, and marina owners in the Lower Keys, I mentioned our meeting with Carol to a salty-looking old gent by the name of Tom Benton, a veteran BoatUS CAT team member who’d been working the Coconut Grove area all day, well north of Big Pine, meeting with a variety of people and doing damage assessments. Benton was wolfing an appetizer in the lobby of the Miami ­hotel the CAT team had established as an impromptu headquarters. He’d missed lunch while dealing with issues at Dinner Key Marina, where he said more than 30 boats had been sunk and many, many more were either radically damaged or totaled. 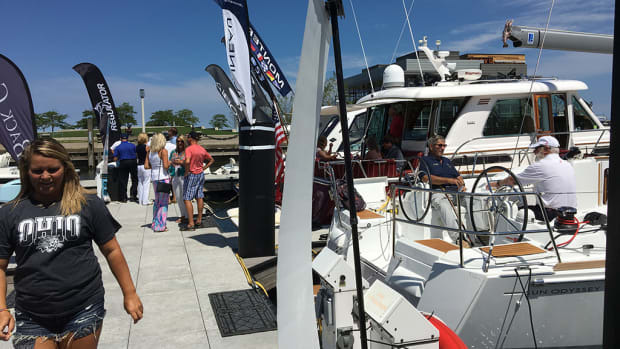 A certified marine surveyor with 25 years of experience, Benton had been doing catastrophe-related work since Hurricane Sandy ravaged the northeastern United States in 2012. After spending two weeks in Houston, Texas, tangling with the aftermath of Hurricane Harvey, he’d come directly to Florida without a break. 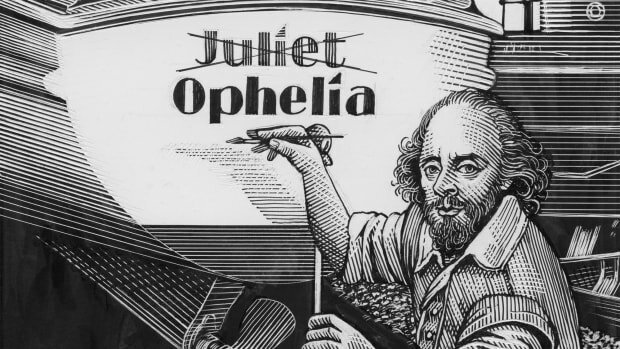 “A little worn down this evening,” by his own admission, he was nevertheless in a philosophical mood, he said, and figured he had a theory about Carol and indeed many other boat owners. From a nearby seat, Benton’s boss, CAT Team Coordinator Mike McCook, shot Benton a faint grin of acknowledgement. McCook, too, had been on the catastrophe trail for well over a month, going from one storm to the next without a break. He was no disaster tourist either. He’d been doing CAT team work year after year since 1978. “Things’ll get worked out for this lady—we try to do right by people,” McCook suggested, before excusing himself. He was tired, he said, and needed to hit the rack. 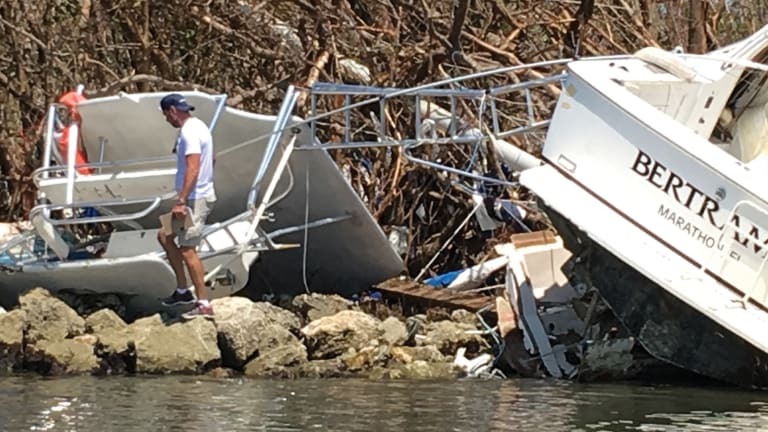 The following morning, while Croft and I examined the hurricane damage at Dinner Key and spoke with several boat owners there, Croft opined that many—if not most—boaters tend to ignore the vagaries and complexities of marine insurance. 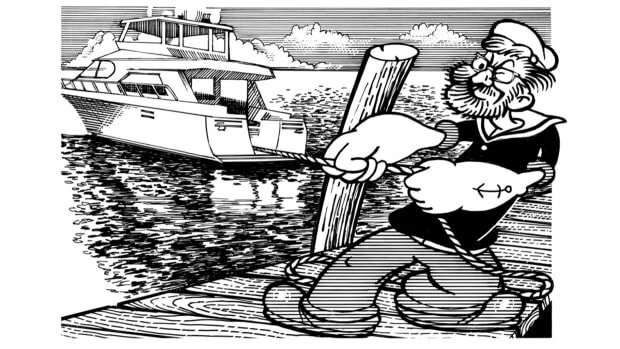 The topic, he said, is often considered boring, laden with tough-to-understand fine print, and completely at odds with the free-form enjoyment that boating typically represents. During the flight home that afternoon, however, with what I’d seen at Dinner Key and Big Pine still sloshing back and forth between my ears, I was constrained to review this rather cavalier attitude. Yeah, the cost of a given marine insurance policy is big-time important. But hey, there are other very important considerations as well. Consider salvage, for starters. 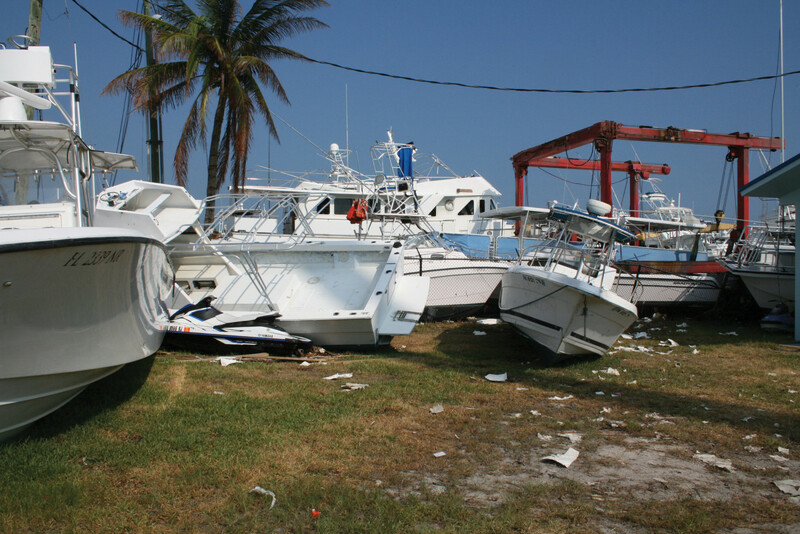 While it’s certainly critical that a boat owner be paid fair value for a storm-damaged vessel by his insurance company, whether said vessel is a total loss or merely in need of repairs, the post-storm disposition of the vessel may be equally critical, mostly because of the physical, financial, and legal challenges salvaging her may present. 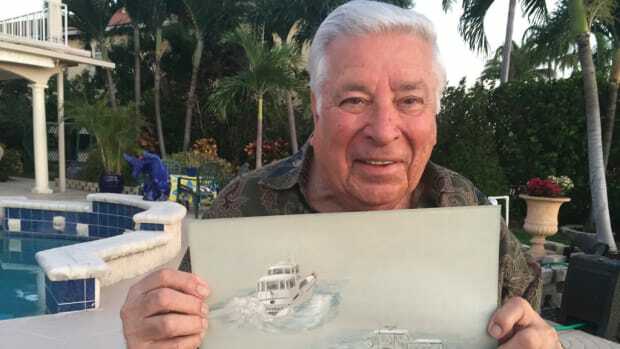 On Key Biscayne, a CAT team member’s attempt to organize the removal of a boat from a privately owned swath of greenery with a crane was reportedly precluded by the homeowner’s attorney and then further complicated by the rapid installation of a fence. Before salvage operations could even begin, BoatUS attorneys had to resolve a tangle of legalities. 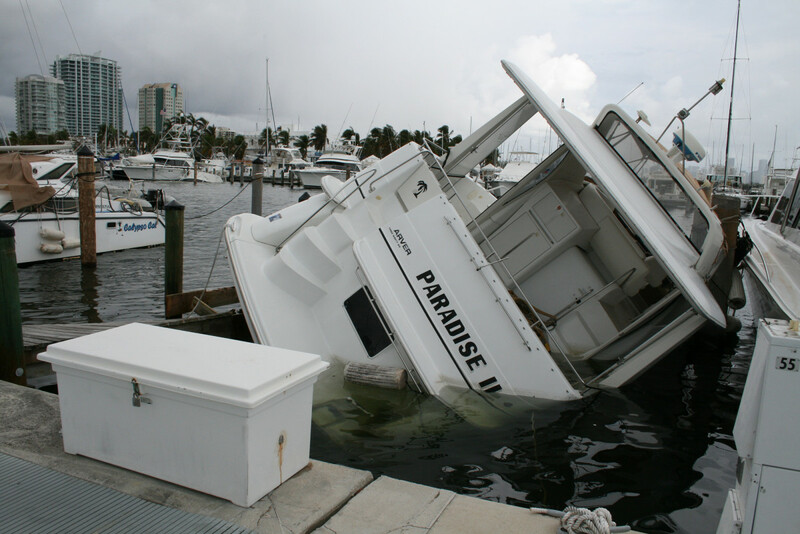 The lesson: Make sure your marine insurance policy pays for all or at least a reasonable share of the costs related to salvage, not just a small percentage. Recovering a damaged vessel and getting her to a repair facility can get complicated and expensive in a hurry. And so can the removal of a vessel that’s been officially totaled. Then there’s the liability-only coverage that’s popular with owners of older boats, mostly because it’s cheap. One of the first things I did upon returning home from my trip to South Florida was haul out the Declarations Page of my marine insurance policy and determine, with great relief, that I hadn’t gone the bare-bones liability-only route, an approach that banks and other lending institutions tend to frown upon but occasionally overlook. Although liability-only policies typically provide coverage for property damage and bodily injury to others, they often cover little else. The lesson: If you opt for liability-only, read the fine print. 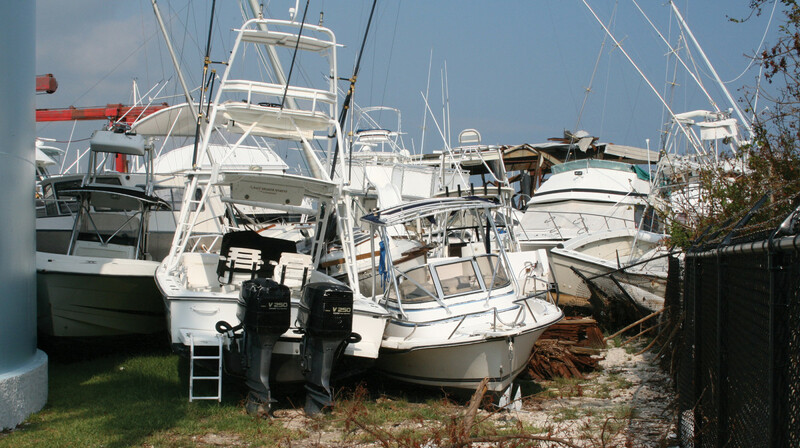 In a bad storm’s wake, you could wind up owing for wreck removal and salvage, as well as oil-spill-related expenses generated by your boat. The maximum exposure on the latter item? A staggering $939,800! Just sayin’. And finally, there’s the relationship factor. 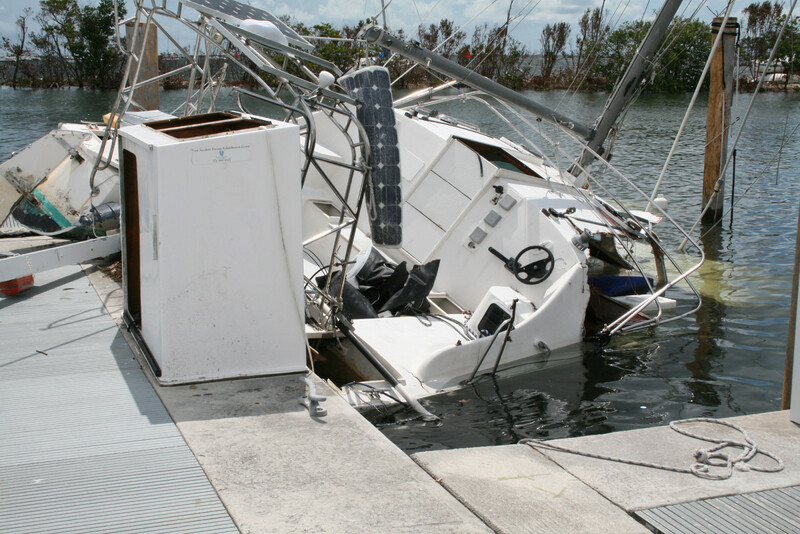 Imagine the kettle of fish a boat owner could find himself in should his marine insurance company, during a storm’s aftermath, hand him a check for the insured value of his craft and then simply walk away. If such an owner happened to be living on Irma-ravaged Big Pine Key at the time of this hypothetical scenario, it’s possible that he’d then have to deal, not only with the total loss of his boat, but with the total loss of his home and his business, as well as the absence of electricity, clean water, cell service, and emergency services. 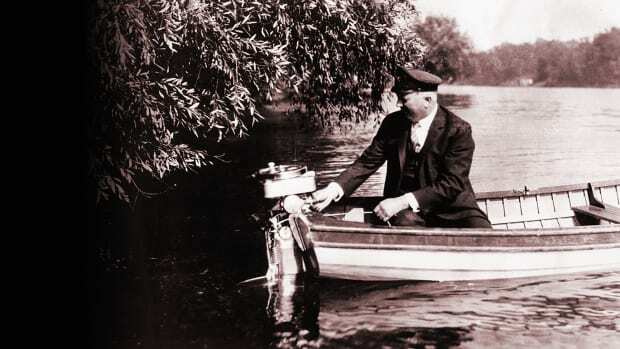 Is it reasonable to expect that such an individual, given these complexities, could effectively organize the salvage of a vessel that may be residing in a tree somewhere or laying at the bottom of a distant neighbor’s swimming pool? The lesson: Make sure your marine insurance company has longstanding relationships with experienced local marine contractors who will be willing and able to help out (with barges, tugboats, trucks, cranes, lift bags, dewatering pumps, divers, etc.) during the immediate aftermath of a catastrophic storm. Otherwise, you may find yourself standing in the midst of total chaos, not knowing who or where to call, with a cellphone that doesn’t work! Just prior to press time, I called Carol Hawkins to see what had become of her cherished Glacier Bay 26. The story was fairly typical of situations where deep sentiments are involved. BoatUS, she said, had declared her boat a total loss and paid her the original purchase price, minus a $3,000 deductible. Then the company had allowed her to buy the vessel back for a “reasonable” amount. “So, as a result, I could keep her and have her repaired,” Carol enthused warmly. 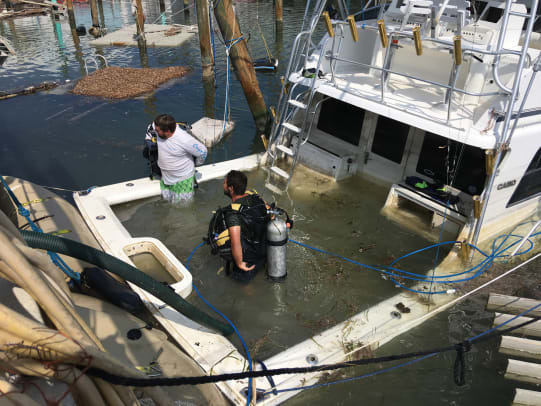 TowBoatUS skipper Freestone performed the actual salvage operation, towing Carol’s boat into a nearby cove and then lifting her free of her element with a crane so she could be trailered to a temporary holding area. After a CAT team rep had performed an examination there and totaled the boat officially, Hawkins signed off on the buy-back paperwork and moved her pride-and-joy farther north to a shop in Central Florida where repairs (gelcoat work, new engines, and new electrics) could be completed.